Nice memory in the beginning of this one, Walt and Jesse's first cook, Walts first lie, in the same desert we were left in last week where the shootout between hank and Todd's uncle. AMC showed last weeks episode just before this one popped off and if you didn't notice Marie was wearing all black in a show she consistently wears purple that may have been the firs indication of how Ozymandias was going to begin. There's no long action sequence, we here the gunshots stop, Hank took one in his leg and Gomi has already fallen to the hail of gunfire. Walter White hasn't been the only character in this show that evolved into something he wasn't when it started. Hank was a law enforcement stereotype, bad jokes, treated work like a game, even his own courage would come into question with himself when he experienced the level of violence the cartels dealt when he first transferred out of his own department. Now, in the final episodes we see Hank has evolved into a fearless, hungry for justice detective. His courage, undoubtedly unafraid when he told Walt, who was pleading for his life to be spared told Jack, "Just do what you're gonna do" and he prefaced it with an F-bomb before he got executed. Walt took it hard, there was no Heisenberg tough guy moment here, he was broken and beaten and truly did not understand his position when dealing with weird Todd and his Uncle. They take all his money, and leave Walt with one barrel. He pretty much got robbed by men he thought were his own. Jesse, did his best to hide under Walt's car while all this was happening and he gets spared because of the information he has and the fact that the only one that can cook Crystal Blue as pure as Mr. White does is Jesse. After having information beat out of him, he gets blackmailed into cooking with Todd with the threat of hurting Brock and his mother....Jesse and kids...his kryptonite. 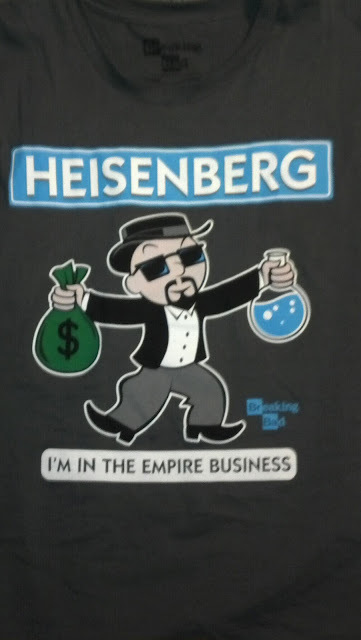 No Heisenberg toughness in this episode. Walter, having been left in the desert with an 11 million dollar barrel and a car leaking gas from a bullet hole he makes his way home by buying a pick up from some desert hermit. Back at A1A car wash Marie thinks she's going to have an A-1 day by telling Skyler what's what since to her knowledge Hank has got Walt in processing after placing him under arrest. She doesn't know Hank has been sent to Belize, when the family gets back home Walter tries to get them to leave with him but Skyler just wants to know how he got away, she knows but she needs to hear Walter admit it in her weird control freak way of dealing with things (I'm saying that for a reason I'll get to). She figures of out to know Hank is gone, and grabs a knife to defend herself from Walt and get him out of the house, they have pretty disturbing fight in the living room and Walt Jr. "Flynn", takes a dice on Walt to break it up and call the police. That's enough for Walt to get out but not before grabbing his baby daughter Holly. The entire scene was pretty intense to say the lease, the way it was shot made you think someone was going to die accidentally or some other craziness would happen. Walt eventually leaves the baby with a fire company after realizing a baby needs its mother when Holly asks for Mommy over and over. A former Kingpin on the run could only be slowed down by a baby anyway. He does the right thing but not after making a phone call to Skyler, where he pretty much says to her...what he could/should have said before he got cancer. It's pretty long speech but after telling her about all his frustrations, she says "I'm sorry", and it seems like she feels how she may have pushed him into this life. Walt tries to pull a Heisenberg one last time and tells her to "toe the line, or you'll wind up just like Hank". Pretty intense episode all the way through, Flynn's knowledge of the whole thing may have been the only wasted time on screen. I always felt for story telling purposes, he was there to be a victim of his fathers poor decisions in the Drug Lord business and something terrible would befall the whole family. Who knows, it may still happen or this may be it happening...only two left and we find out what that M-60 is for. Maybe if he gave a stern edited message of what he said over the phone to Skyler last night he wouldn't have had to get into the Empire Business.